Bloodshot Records I've come to realize is my favourite record label. I don't like every band on the label but so many bands I've come to enjoy I got into through Bloodshot Records samplers that I ordered along with Waco Brothers cds I think. The Waco's were the first Bloodshot band I heard, they did a cover of Revolution Blues which was mentioned on the Rust List. I tracked it down and at first I wasn't as into the Waco's and whole alt.country scene. But now I have to say alt.country and the music it harkens back to is what I mostly listen too. Shockingly I've never seen a single Bloodshot band live. The Waco's rarely play outside of Chicago or Austin it seems. Once Split Lip Rayfield came to town, I'd never even heard of them but the Georgia Straight made it a Straight Choice, I was going to go, but Thor was tired and I ended up going with Tracey to the Fox and Firkin. I've since become Hip to the Lip! This shirt was singled out on multiple ocaisions as one my Mexican MBA classmates favourite shirt of mine. 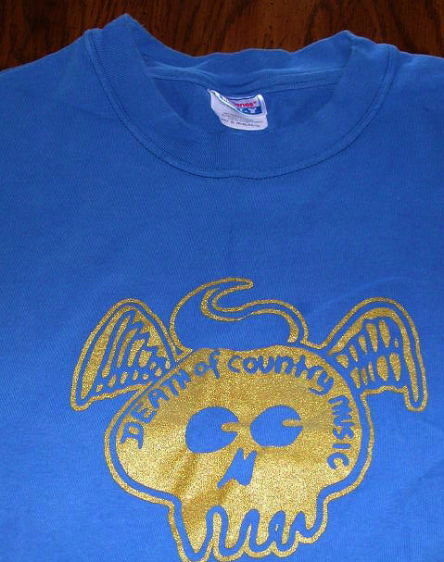 I don't know if he really likes blue and gold, skulls or hates country music or what. The shirt is partly meant to be ironic.